With a resume including TV hits like “Alcatraz,” “Fringe” and “Once Upon Time,” actor Greyston Holt has found himself on Syfy’s new series, “Bitten,” where he gets in touch with his beastly side. He sat down for an exclusive interview with us to talk about the show. Q: You’ve got a new series coming up called “Bitten,” based on the popular books by Kelley Armstrong, but werewolves on TV are pretty rare, probably due to the heavy special effects. What are some differences in this series from say, the “True Blood” werewolves or the “Twilight” movie series? 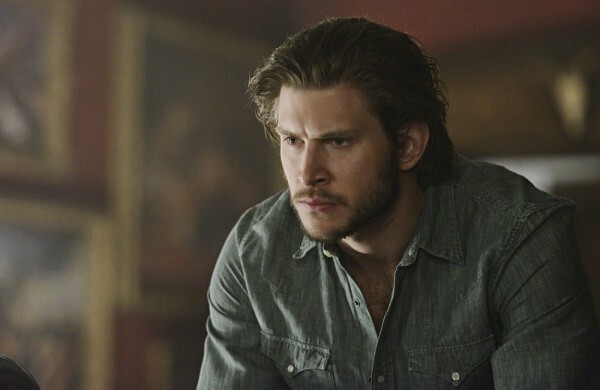 Greyston Holt: I mean, to be honest, I haven’t seen the other ones. But I just consider ours as a very grown-up, adult version of that. Our wolves look fantastic and the tone of our show’s just a little darker. It’s pretty amazing what we pulled together. I mean, we didn’t have a “Twilight”-like budget, obviously. But our team really came through and created some really neat wolves. They actually even have our own eyes. We did these eyes scans, so if you freeze a frame or there’s a close-up, those are our eyes in the wolves. Q: So now, the premise of the series is that there’s a pack of wolves but it’s headed up by a woman? And she’s the only female werewolf, correct? GH: She doesn’t really head the pack. Our pack Alpha is Jeremy Danvers. Elena was with the pack but she left … We had a bit of a falling out. I bit her. I turned her into a werewolf … She’s now moved to Toronto, which is where the series picks up, and she’s kind of trying to live some semblance of a normal life with a new guy there. But there’s been recent mutt activity in Stonehaven, which is where our pack lives. So Jeremy calls upon her to help us out because she’s our best tracker. But she’s conflicted because I’m her former lover (but) she has her life in Toronto. Q: So I presume that there’s going to be a little romantic tension going on there for this season? GH: Oh, yes. Tension galore. Q: So what was it that drew you to the script and into the series itself? GH: It’s a really interesting character to play for me because there’s this internal struggle constantly between his loyalty to Jeremy, our pack Alpha, who I swore an oath to. He basically found me in the swamps running around feral as the young werewolf and he domesticated me and brought me up and then taught me the ways. So I have my oath to him and my loyalty to him but I also have my only love, the only woman I’ve ever loved is Elena and the only woman I ever will love. So there’s this struggle. You know, I want to have her but I can’t because ultimately my loyalty is to Jeremy. Just the way, that’s the animal side of it, you know, the struggle. Q: What’s been the most challenging part of this role so far for you? GH: I’m a really nice guy and I’ve never been in a fight in my life. This character, he’s really explosive and he can just turn immediately if he’s threatened or if there’s somebody he doesn’t like. That was an interesting, it was a challenge. It was a fun challenge but that was something new to me. Q: What part of the character do you feel like is most similar to you in real life? GH: He’s kind of an observer. He doesn’t always say a lot. I mean, I’m fairly cerebral, I guess. You know, analytical. And that’s something that I can relate to. Q: For people that maybe have read the book and have certain expectations for the series, what will be the most surprising thing about watching it as opposed to reading the book? GH: Well, we follow and stay fairly true to the book. But we did take some of our own liberties. So I think some of the fans will be maybe a little shocked. But not overly, like we’re not changing the whole plot line. But the introduction of some new characters, I think people will like. Q: How has the cast bonded on this new project? GH: Yeah, we really did. And it happened immediately. We were very fortunate because, you know, that doesn’t always happen in this business that you get along with all your cast mates. But we truly did all get along right away from our first table read. So that just helps the series and the show. I mean, there’s nothing false about our relationships. It’s all genuine and we just really do like each other and want to be there. So I think that shows in the show. Q: For people that maybe haven’t read the book and aren’t familiar with it, what would you tell them is the best reason to tune in and get involved in the show? GH: We just kind of offer something for everybody. I mean, no matter what your taste is. We have the romance side of it. We have tons of amazing action sequences. There’s gore. There’s also this, you know, manly, burly side, which is the pack. And Stonehaven, our set, our interiors of Stonehaven are so beautiful and just dark and rich. It’s the kind of room you want to have a scotch in and smoke a cigar. So I think, yeah, it will appeal to a broad spectrum of people. Q: But this one is refreshingly vampire free, correct? Unlike the “Twilight” series. GH: Yes. And I’m fairly certain it will always be. Werewolves are badass. You know, we don’t sparkle and we’re manly and hairy. Q: Well, except for your heroine. Hopefully she’s not too hairy except when she’s transformed. GH: Except for her… She looks delicate but she’s badass and strong. “Bitten” premiered January 13 on Syfy.